I am sure many of you have used the traditional way of cleaning your floors with a bucket and mop and found that the hardest part is actually ringing the water out of the mop? Right? Not with the Hurricane Spin Mop, this mop have a nice system which will ring dry your mop like a spin dry on a washing machine, it is ergonomic and most all it will save you time. The uniquely designed bucket, has a spinning component which you simply place the mop in, press a pedal and in a few spins most,the water is spun dry and ready to mop again. Click here to buy The Hurricane Mop is available at Amazon. With your help we can reach more people and let them know about Hurricane Spin Mop whether this product works or not. Mop was delivered within a few days. Came with NO instructions on how to connect the mop handle. Anyway, I managed that okay. I think the bucket is a very good idea but I'm not crazy about the mop. As I sweep it across my wood laminate floors, it tips onto it's side and rarely rolls along the baseboard. Apparently I have to learn a whole different way of mopping. It also DOES NOT pick up dirt, hair, etc. You DO still have to dustmop or sweep your floors prior to using the mop. I bought mine at WM and am debating whether to return it. The mop is NOT the one advertised on the infomercial so don't be surpised when you open the box. The cheap materials are not reassuring. Someone needs to up the quality and step away from false advertising. This has the potential to be a wonderful product. The mop works yes but it's not worth the 39.99 + 12.95 shipping at all. The mop head used in the commercial is not what you get in the box. The mop head we got has much shorter and sparser strands, it's not the nice full long one you see on TV. The whole thing is cheap plastic, I've seen knock off's off this mop that are higher quality. They said buy one get one free just pay extra shipping and when we ordered on the website it was buy one pay 19.99 for the other one plus 12.95 shipping. So thats 72$ about for 2 cheap mops that are worth maybe 10$. They also offered the "Ddelux Bucket" that has a spinner in the wash part of the bucket also but no one has ever heard of it? It isn't available but the website has a picture of it in the instructions? 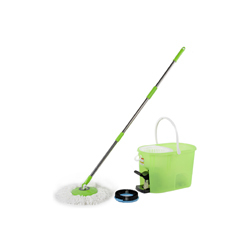 I would say order a better quality version of this mop from somewhere else there are better ones from other makers online for the same price, so what if you don't get a free sticky buddy you'll never use it. I ordered the mop and the commercial said buy one get the 2nd one for free (just pay seperate shipping and handling). When I got it there was only 1 mop. THe 2nd mop was going to be for my daughter. I have waited on hold on the phone for 48 mins. They told me i had to pay seperate shipping and handling which i thought i did as there was a charge on my card and on the billing statement for S&H $12.99 and another shipping charge for S&H $9.99 plus plus another charge for $39.98. So one mop has cost me over $62. Now they want to charge me another $19.99 for the 2nd so called free mop. I told them to skip the entire thing and i was sending it all back, they told me i have to pay for shipping if I want to send it back. WOW!! THis company is a rip off and its hard to understand them, of course they are in India! Never Again! DECEPTIVE ADVERTISING. Unable to speak to anyone until product is being shipped. Even if order is cancelled they still ship it to you with bogus shipping cost. Then they try to persuade you to keep the product offering you $10.00 off saying that it will cost you move to return ship it. Box shows that product was returned before (numerous tapings). It is about the principle involved in their advertising that made me return the product. I decided to lose $18.75 to ship FedEx then to pay $52.00 dollars for a mop and a bucket. Still cost the original $19.00 they initially advertised but I saved $33.00 in the process. BUYER BEWARE... This is not worth one STAR. watched the infomercial, tried to place order online but there was no option for the 2nd set free just pay S & H. so I decided to call the toll free #. Automated order line, didnt offer 2nd set either or even give me a total that my card would be charged. I asked to speak to a live representative and after 20 minute hold and being passed to 4 people, I got a live person....who could give me no info just a phone # for customer service in INDIA! By this time I am so aggrevated I just want to forget the whole thing and he tells me I have to call back in 2 days after my order gets in the system to cancel. I would like to try this mop, but it is not worth the hassle and now I am afraid my card is going to be charged, I just don't know how much or how many times. Guess I will keep in touch with my bank til this is over. I dont know how they sell ANY mops as difficult as it is to place an order and the web site is not user friendly, even the guy from INDIA said they had been having problems with it. I WILL NEVER ORDER ANYTHING LIKE THIS AGAIN!!! We are ok with the product with one major exception. No parts are available to repair the leaky seal on the spinning mechanism and no service to repair it is available. The manufacturer does not stand by their product. They just want you to purchase another. very poor quality product. all plastic, and i didnt dare let my mom use it, just returned it. telebrands marketing charged 16.95 to send and to return it cost over 24.00. misleading advertising especially for elderly people on fixed incomes. they charged 54.97 for the mop and then charged an additional 14.95 for the mop bucket dolly! for 55 dollars you would expect the bucket that makes the mop work to be included in the price. the only thing that they could keejp saying was that if i read the fine print, they never implied that they come together and that they did nothing wrong. These people are very deceptive thieves that prey on the old. protect your parents and dont buy this product. if they really stood behind thier product they would have paid the return shipping charge. instead they stole from my mom. shame on them. she may as well take 34 dollars and thrown it into a trash can. that money could have paid for her groceries for the week. awful product awful costumer service, buyer beware.